In 1897 The Lancet printed the news story of ‘the Scientific Constable’. This referred to a recent case in Lancashire where a local policeman had been called to appear at a coroner’s inquest. Much to the dismay of the journal, the policeman – having previously attended a series of ambulance lectures – was invited to give evidence regarding the injuries he had found on encountering a dead body: a dislocated neck, severed carotid artery, and fractures to the left arm and ribs. The case brought to a head simmering tensions between the medical profession and the flourishing first aid movement. At stake was the extent to which those trained in first aid were entangling themselves in the business of doctors, and particularly, of surgeons. The St. John Ambulance Association was formed in 1877 under the guidance of solicitor John Furley (1836-1919). Influenced by the formation of the Red Cross in 1863, which sought to organize voluntary care for sick and wounded soldiers, the St. John Ambulance Association was nonetheless different in scope, primarily aimed towards training men and women to be able to respond to emergencies within a civilian context. Accidents were becoming embedded in the public consciousness in the wake of increasing political and media attention regarding the number of industrial accidents and workplace injuries that were occurring. Men working in occupations where there was a high chance of encountering such incidents (railway workers and policemen in particular) populated the early ranks of trainees. The movement was also reflective of a growing impetus among medical professionals and others to diffuse information and advice among the public about health and illness. Broader structural changes had been achieved in sanitary reform by this point, with the Public Health Act of 1875, and attention was turning to the role of individual citizens in promoting public health, for example through personal hygiene and domestic management. Hierarchical in its structure with militaristic overtones, the St. John Ambulance Association reinforced the notion of the active, ordered, healthful and health-promoting citizen, and the public’s role in improving the nation’s well-being. The Association attracted members from all walks of life, from miners to Mayfair ladies. That it was popular with women provoked a degree of anger from some: ‘If ladies want a hobby to ride, why should they not unite to try to improve the donkeys of the poor in our large towns; see that the ragged urchins at our schools have proper clothing; and help medical men in providing the necessitous sick with nourishment?’, grumbled one practitioner to The Lancet in 1881. In the 1880s the role of women in medical care was still precarious. While the passing of the 1876 Medical Act allowed women to train as doctors in the United Kingdom, organizations such as the British Medical Association and the Royal College of Surgeons still forbade women to join their ranks. St. John Ambulance gave women and girls a more obtainable means of medical education and was lauded by women’s magazines, who often published news, queries and fictional tales about the good work of the organization. Typical of this was a short story published in an 1886 issue of Girls’ Own Paper, ‘Little Hand of Mickle Might’ by Jessie Saxby which told the story of Lady Avis, a sensible young woman sent to the Highlands by her fashionable London family. Her skills learnt at Ambulance classes are put to work saving a small child who had been accidentally shot; ‘do you know, I soon learned how to set bones and stop bleeding, and things like that! It is very interesting work’, the heroine recounts of the classes. Active recruitment of the public into organized healthcare was somewhat controversial, highlighting continued insecurities among the medical profession with respect to its authority. As so today, first aid training taught the public to deal with an array of emergency situations: from resuscitation of the drowning to aiding a person having an epileptic fit. But the movement also had a strong surgical element, furnishing participants with sufficient anatomical and physiological knowledge to splint a fracture, bandage and dress serious wounds, and prepare the injured party as much as possible for professional surgery. This surgical focus provided useful fodder for those who sought to highlight first aid’s potential dangers. First aiders were often accused of ‘playing at surgery’, or acting as ‘amateur surgeons’, the terms conjuring up something rather more graphic than ‘amateur doctor’ might have done. This terminology was not entirely without foundation. In his 1885 manual of ambulance lectures the surgeon Samuel Osborn, an examiner for St. John Ambulance, suggested to first aiders a number of makeshift operations that could be deployed if a professional surgeon could not be found, from using human hair to stitch together a wounded lip, to cauterizing bleeding wounds using a white-hot piece of twisted telegraph wire. Recounting methods to stall acute bleeding after a tooth removal, Osborn even cited a technique that had been suggested to him by a carpenter, who had used a screw wrapped in a linen rag to plug the gap left by a missing tooth. The screw was held in place by attaching a piece of string to prevent a patient from accidentally swallowing it. Such clever little tricks evoked a long tradition of technological ingenuity in surgery, and the possibility that the innovative spirit and manual dexterity of the public might be used to positive effect in dealing with accidents and emergencies. Figures like Osborn were nonetheless careful to warn first aiders not to overstep the boundaries of their knowledge and training. Their job was strictly to assist before the arrival of a medical practitioner. Thus, a case like that of the ‘scientific constable’ was seen as proof of laypeople overstepping that boundary by those critical of the movement. There were tensions felt on both sides: the journal First Aid, read by members of the St. John Ambulance and similar organizations, expressed concern about the case, warning readers not to pose as amateur doctors, for ‘if they ever attempt it, the medical men will resent it’. The journal was acutely aware that the goodwill of the profession needed to be maintained, both for the practical reason of retaining doctors to help run classes, but also for the prestige and respectability that came with having the profession on their side. Fig.1 Excerpt from an 1891 issue of the comic periodical Funny Folk. The piece ‘First Aid to the Injured’ gently mocked the newly trained first aider, eager to try out their surgical skills. © British Library. For the most part, concerns that first aid training would lead to attempts among the public to perform amateur surgery appear to have been unfounded. There is little evidence from contemporary newspapers and periodicals of the public getting their hands bloody. Most press reports commented on the positive effects of the movement, although newspapers were not averse to gently mocking the new first aider, fresh from training and eager to use their recently acquired skills (see fig.1). ‘Is it not time that the old yarn about the ambulance young lady who fixed up the wrong limb should be dropped? 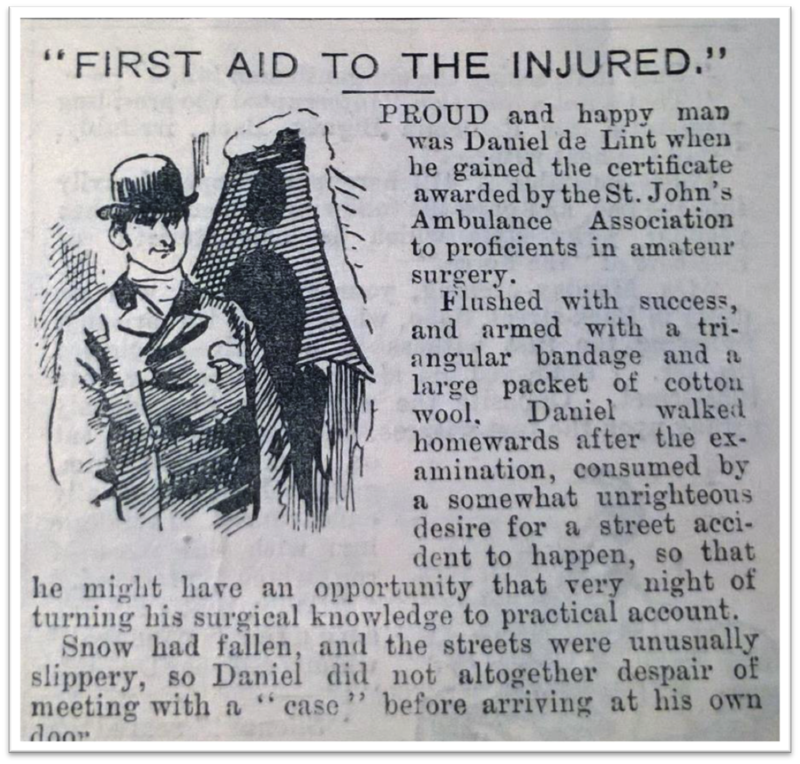 ‘, asked First Aid in 1895. But such stereotypes sustained: a Punch cartoon from 1914 (fig.2) lampooned the well-meaning lady first aider, depicting a young woman at a Red Cross lecture being admonished by the doctor for breaking a young boy’s ankle during bandaging practice. Fig.2 Cartoon from Punch , 1914. Doctor (at Ambulance Class) ‘My dear lady, do you realise that his lad’s ankle was supposed to be broken before you bandaged it?’ © Wellcome Images, Wellcome Library, London. The current swing towards citizen-led science via organizations such as Zooniverse (www.zooniverse.org), with its emphasis on contributions from members of the public, is mirrored in the changing dynamics of medicine, where patients are playing an ever more prominent role in decision-making. The British Medical Journal now has a dedicated patient editor, many medical Colleges have lay members on their council, and the doctor-patient relationship is increasingly understood as a partnership rather than a hierarchy. But when it comes to practical, hands on medicine, the boundaries between the professional and the public are often more rigorously policed. Amateur botany is one thing, some might say, but amateur surgery quite another. For many decades, the St. John Ambulance Association and other first aid organizations have been working at the boundaries of professional and amateur medical care. This has at times required delicate negotiation, and such organizations have always stressed the limits of the volunteer role in emergency medical situations. But by virtue of existing, they highlight the limits of professional medicine too. Doctors cannot be everywhere at all times. For historians of surgery, reflecting on the first-aid movement posits further questions. Have we done enough to understand surgery outside of its professional context, particularly in relation to modern surgery? Has the study of major operations drawn our attention away from the minor and makeshift procedures that have occurred and still occur? How invasive must a procedure be to ‘count’ as surgery? The first aid movement, as well as having its own rich history, can perhaps help us to begin answering those questions, pushing us to think about the way we define surgery, and the instability of the category itself. Sally Frampton is a postdoctoral researcher at the University of Oxford where she is working on Constructing Scientific Communities: Citizen Science in the 19th and 21st Centuries. Her current research focuses on public participation in the medical sphere during the nineteenth century with a particular interest in how periodicals facilitated this participation. She is also working on a monograph about ovariotomy and surgical innovation in the nineteenth century. You can find her on Twitter at @salsyframpton. ‘The Scientific Constable: A New Departure’, The Lancet 150 no.3866 (1897) 868. Ronnie Cole-MacKintosh, A Century of Service to Mankind: A History of St. John Ambulance Brigade (London, Century Benham, 1896) 16. Neil Carter, ‘Voluntary First Aid: The role of St. John Ambulance Brigade’, 2006 (Conference paper, accessed 5th October 2015 https://www.academia.edu/3191234/Voluntary_First_Aid_The_role_of_St._John_Ambulance_Brigade). ‘A Country Practitioner’, ‘The St. John Ambulance Association’, The Lancet 119 no.3039 (1881) 931. Jessie M.E Saxby, ‘Little Hand of Mickle Might’, The Girl’s Own Paper summer supplement (1886) 36-38: 37. Roger Cooter, ‘The Moment of the Accident: Culture, Militarism and Modernity in Late-Victorian Britain’, Roger Cooter and Bill Luckin (eds), Accidents in History: Injuries, Fatalities and Social Relations (Amsterdam: Rodopi, 1997) 107-57: 109. ‘A Word of Warning’, First Aid 4, no.41 (1897) 232. ‘Tourniquet’, First Aid 1, no.7 (1895) 49.